Have you forgot your ESIC number and want to know how to find your lost ESIC number online? ESIC is providing so many online services but unfortunately, ESIC hasn’t provided any provision for the employee i.e ESIC member to find their ESIC IP number online. But there are some ways by using that we can do ESIC number search by name, but it has to be done only by your employer. Generally, it is the responsibility of insured persons to keep their ESI numbers with them throughout their lifetime. If they can’t keep their ESI numbers with them or whenever employees change their ESI numbers regularly when they join in the new job then it leads to duplication of ESIC IP numbers and it makes insured persons ineligible for ESI benefits. 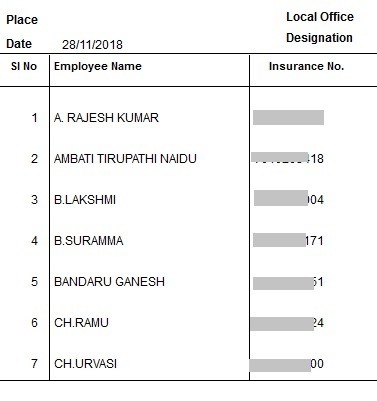 In case insured person changes a job then they have to visit their previous employer because every employer will keep data of employees ESIC numbers. We can also find our ESI IP numbers on ESI Pehchan cards and in some companies the ESI IP number of employees will be printed on pay slips. So before going to meet the employer, it is better to check the Pehchan card and pay slips. Now employee state insurance corporation has made it mandatory to link Aadhar number of insured persons with their IP number. Now every ESIC IP number need to be linked with Aadhar number, if your IP number is also linked with your Aadhar then you can contact your regional ESIC office regarding your ESIC IP number. As I said earlier every employer can find ESIC numbers of their employees in their employer ESIC portal, but these ESIC numbers are available until employer doesn’t delete employee from ESIC portal. Until they don’t mention their exit date of ESIC member. Step 1:- To find ESIC number of employees employers need to login to their employer ESIC portal with their establishment id and password. 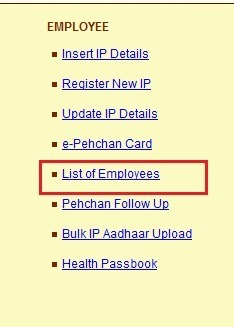 Step 2:- In the home page of employer ESIC portal there is an option called list of employees, now click on that. Now a new page will open where you can find ESIC numbers of all the active employees. Even though we can’t find ESI number by name, but if we have ESIC number then we can download temporary ESIC card online. But remember only your employer can able to download your temporary ESIC card. Step 1:- To download ESIC temporary id card login to employer ESIC portal with establishment id and password. 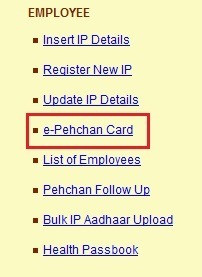 Now in the home page, there is an option called e pehchan card under the employee section, now click on that link. Step 2:- Now a new page will open there enter ESI number of the employee, and there is no need to enter other details, just enter ESI number of the employee and click on view. Now the details of the ESIC member will open, you can find those details in below image. Step 3:- Now click on view counterfoil ( i.e temporary ESIC card). Once you click on print counter foil a new page will open their employee temporary ESIC card is available. Employer can give you the print out of the temporary E Pehchan card. Conclusion: Till now employees can’t do ESIC number search by name online but they can get their forgotten ESIC numbers from their employer. Any employer can find the ESIC number of their employees in their employer ESIC portal by just checking the name of the ESIC member. It is working when you join in new job continue that ESIC number. I AM IP MY NAME CHANGE.